QAP2E XL Quick Access Digital Pistol Safe is rated 3.0 out of 5 by 2. 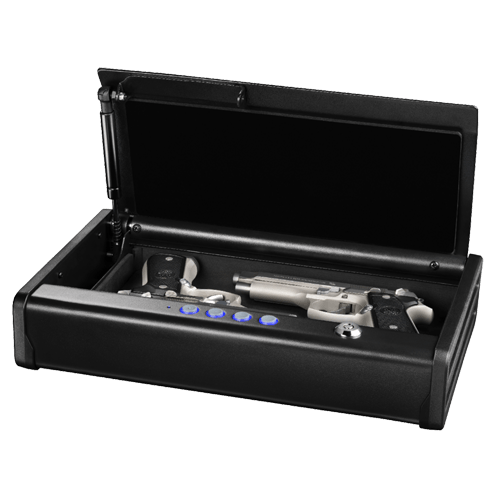 The QAP2E Quick Access Pistol Safe protects your handguns from unwanted access and theft with reliable security features and advanced locking technology. The QAP2E offers storage for two standard handguns or one large pistol and ammunition. This gun safe provides extra security for your handguns with strong solid steel construction, a pry resistant door and bolt-down hardware. This safe also offers quick and reliable access with a digital locking system that allows for single handed entry and a compression gas strut. Rated 5 out of 5 by Michael7077 from Sturdy and convenient I like the low profile and easy access. You can feel the touch pads without seeing them and enter the code easily.